Ceramic and polymer are both common materials used for crafting, and they are suitable for different applications. Ceramic and polymer are manufactured in clay form for craft work. Ceramic clay is the better material for crafting any kind of dishware, pottery or sculpture, while polymer clay is preferable for smaller-scale projects and children's crafts. Although ceramic is an inorganic material like polymer, ceramic is made up of naturally occurring substances and is one of the oldest building and crafting materials known to man. Ancient man made pottery and bricks from ceramic clay, and ceramic is still used for those purposes today. Ceramic is a mixture of earth minerals, clay, and water. Polymer is a man-made synthetic -- essentially, a plastic manufactured in many different forms. For crafting purposes, polymer comes in clay form. Although it is called "polymer clay," there is no actual clay in the material. It is merely called "clay" due to similarity in use and malleability. Some brands of polymer clay can be oven-dried the same way ceramics are kiln-dried, but intense heat can cause polymer to release dangerous fumes. Therefore, polymer is not the ideal material for any kind of drink or dishware, because cups and plates are frequently microwaved and run through a hot dishwasher. Polymer clay is an otherwise safe crafting material for children and adults. Ceramic clay created for craft and pottery use is non-toxic, although you should also use a non-toxic ceramic glaze if you are making anything that might be used to hold drinks or food. Ceramic and polymer each have their individual uses although almost any small-scale item can be made of either ceramic or polymer, such as beads or charms. Wheel-thrown pottery and large sculptures are usually made of ceramics. A craft item that needs to have a plastic feel or strong durability, such as a key chain, should be made of polymer. Ceramic is more fragile and brittle than polymer, so it is the better choice for crafted items that will be carefully handled. Ceramic has no color of its own, so it needs to be painted or glazed after it is fired in a kiln. 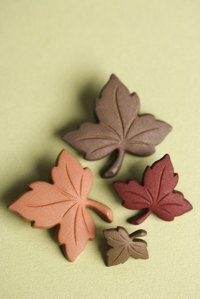 Polymer clay comes pre-dyed in vibrant hues and does not need to be painted. Depending on your skill level and the intended use, you can choose between polymer -- which is easier to work with -- or ceramic, which is more complex. Polymer is a lower maintenance material than ceramic. Polymer clay, unlike ceramic clay, will not dry out if left in the open air. If polymer clay is stored properly away from sunlight and heat, it can be usable for years. Ceramic clay requires special attention to its use and storage. It will quickly dry out if it is not perpetually moistened during the molding process or kept moist for storage in a sealed, airtight container. Polymer clay can be hardened in a domestic household oven, while ceramics need to be cured in a kiln which has much higher temperatures than a regular oven can attain.